In a bowl pour in chocolate chips and add butter. In a small sauce pan heat heavy cream until it just starts to bubble up -be careful not to burn! Pour hot cream over the chocolate chips and butter. With a rubber scrapper mix until all the chocolate and butter is melted and smooth. Cover with plastic wrap. Place in refrigerator for minimum 1 hour. Allowing the chocolate to become solid again. 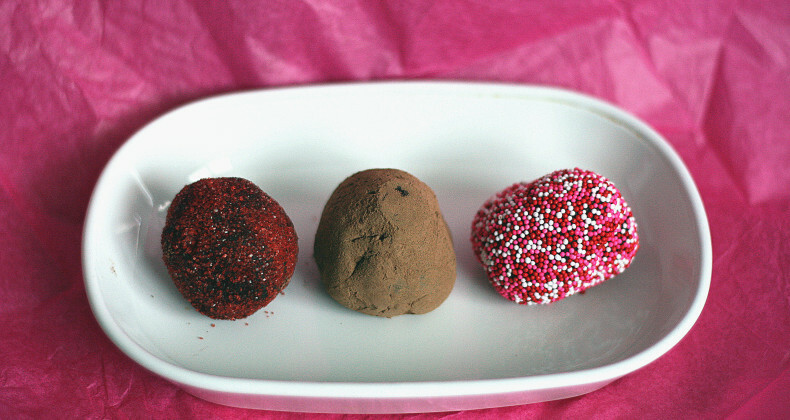 I covered my truffles in red sugar, dutch cocoa powder, and Valentine's day sprinkles.